Faith & Leadership cohort four graduated last week, meaning we have now had 100 students pass through the religious literacy and leadership development programme. Our students are not afraid of challenging conversations around issues of faith and belief in the world today, and the questions surrounding the interaction of religion and global society, from politics and finance to justice, development, lifestyle and education. 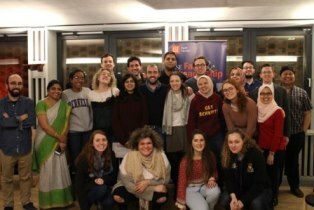 Conversations around the role of religion and current affairs are growing in importance for this century, and we are proud that are students are passionate about engaging across religious diversity and are curious to understand those whose faith and beliefs can be very different from their own. 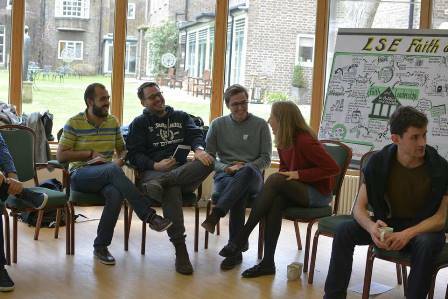 Two of the highlights of this year’s programme have been the residential held at the Royal Foundation of St Katharine’s retreat centre, Limehouse, and the f inal student group presentations to mark the close of the programme. The residential included a mix of panel discussions and sessions on individual values-driven leadership and an introduction to Scriptural Reasoning, a new programme which we will be continuing this term and next in the Faith Centre. Our panel discussion on Faith and Leadership in politics and society today included input from Remona Aly, journalist, commentator and broadcaster, Francis Campbell, Former Ambassador to the Holy See and Rabiha Hannan from New Horizons in British Islam. We were delighted to welcome back Jasvir Singh of City Sikhs and Taha Mangrio, LSE alum from the Financial Conduct Authority to discuss Faith and the City. Our two religious literacy sessions on the residential included The Buddhist Imagination, given by Venerable Ajahn Khemadhammo, Spiritual Director of Angulimala, the Buddhist Prison Chaplaincy, and a session on The Christian Imagination given by Fr Timothy Radcliffe, former Master of the Dominican Order. Common Purpose delivered a thought-provoking session on leading with cultural intelligence where students were invited to reflect on their core values and attributes in leadership, and the contexts in which they would be flexible with their approaches. 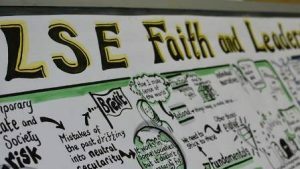 The final evening of Faith & Leadership saw students giving group presentations on a challenge facing faith groups in the world today, and how this can be faced creatively from a leadership pers pective. 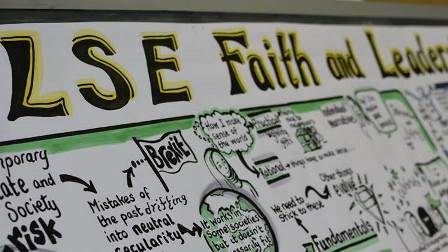 Students chose to present on religion and medicine, Islamic marriage, Jewish atheism, anti-Christian prejudice and how practices of fasting fit with contemporary health concerns. These presentations enabled students to reflect on key issues that have arisen over the course of the Lent term programme and start thinking about how they can be approached in fresh and innovative ways for a new era. It has been a privilege running the Faith & Leadership programme this year and we cannot wait to see what the Class of 2018 will do in their future leadership roles around the world! With immense gratitude to David and Kitty Beecken whose generous funding makes this programme possible.